Remove the leafy parts and the stem of the cauliflower, and cut the cauliflower directly in half from top to bottom. Using the halfs, slice into 1″ thick slices. Mix the flour, spices, almond milk, and water together in a medium sized bowl until well combined. This should create a batter that sticks well to the cauliflower (not too runny, not too sticky. Adjust liquid and flour quantities as necessary. Place bread crumbs in another bowl that is shallow and wide enough for the cauli steaks. Begin to immerse the cauliflower steaks in the batter, and then into the bread crumbs. Coat the cauliflower steaks fully in both batter and bread crumbs for best results. Arrange the cauliflower on the baking sheet and bake for 30 minutes, flipping half way through. When removed from the oven the steaks should have a crispy breaded coating. While the steaks are cooking, melt the butter on the stove top and combine with the hot sauce. Transfer to a shallow bowl and ensure that the sauce is well mixed. Dip the steaks into the hot sauce and ensure that they are well coated before returning to the oven. Bake for 20 more minutes, flipping half way through. Remove the cauliflower steaks from the oven and allow to cool. 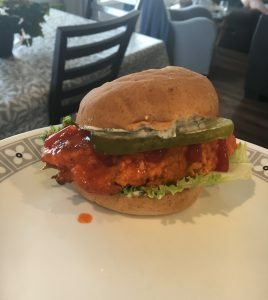 Serve on a gluten free bun with your favourite mayo, pickles, onion, and lettuce.